At the top of 2018, Nielsen revealed that hip-hop beat out rock to become the most popular genre in the US, and few would argue that Spotify’s #3 most followed playlist (10M+ follows) RapCaviar had a big hand in that. Spotify’s ever-growing playlist branding continued to grow with Viva Latino doing the same for the Latin music world. Streaming continues to dismantle the geographic-centric, terrestrial-radio system that limited certain genres’ reach, and there’s certainly no reason country can’t join the rodeo. So break out your slide guitars and freshest Stetson: here comes our breakdown of Spotify’s #7 most popular playlist, Hot Country (Chartmetric link). According to Chartmetric data, Hot Country has 4.9M+ followers, with an average daily increase of ~2-3K. It’s grown 26% over the past 12 months (3.9M+ followers in Aug 2017)- impressive within its tier of Spotify playlist with follow counts near the ~4M range. 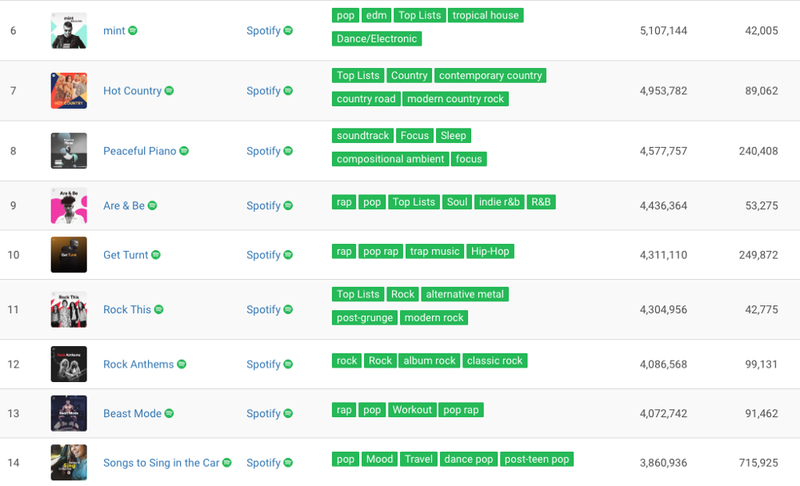 Of those playlists (ranked #6–14) and their follower gain in the past month, Hot Country (92K) is easily outdone by Peaceful Piano (242K), Get Turnt (244K), Rock Anthems (115K), and most surprisingly by Songs to Sing in the Car (753K). This last outlier is a nod to our recent piece on the power of listener context over content/genre, when it comes to playlist curation. On the flip side, Hot Country beats out mint (39K), Are & Be (51K), Rock This (43K), and Beast Mode (89K) in this metric, and so country finds itself middle of the pack in the battle for new Spotify followers. However, where Hot Country (almost) beats out all of its peers is probably where it matters the most: monthly listeners. In a recent piece about the difference between followers and monthly listeners, we explored what those metrics could truly mean to music makers. Now hovering over 1M monthly listeners (beaten only by Songs to Sing in the Car at a whopping 2.8M), Hot Country is otherwise leading its pack in actual listening (which suggests returning customers) and not just the initial dopamine-driven follow that many Spotify users subsequently forget about. Especially given its lower follower count, this leading monthly listener status implies a higher loyalty to Hot Country, which is good news for its artists. It also coincides with a 2017 finding by the Country Music Association (CMA) that yielded an average daily listening time of 4 hours and 49 minutes per day per country fan versus 3 hours and 51 minutes per day per other-genre music fan. This is the kind of engagement that Spotify and many country artists are hoping for beyond their audiences’ traditional preferences for radio, physical sales, and the Pandora platform. For Hot Country (week of July 27 2018), we see quite a diverse set of record labels, which reflects the dynamic relationship between the label and the artist in today’s digital landscape. While it’s no surprise to see the majors at play with UMG (11 tracks), SME (5) and WMG (5), what’s relatively new is Taylor Swift’s Big Machine (7), Jason Aldean’s BBR Music Group (6) and Chris Lane’s Big Loud Records (5) leading the independents- and quite comfortable going toe-to-toe with the majors. To add to the mix: there are five tracks with split equity (indie/major joint venture) setups, and three tracks apparently 100% owned by the artists: two from Missouri-born pop/country artist Filmore, and one from social media-born artist Noah Schnacky. In Hot Country, we basically have every possible label/artist combination- quite a progressive recorded master ownership environment for a “late adopter” genre. In April 2018 and under the direction of John Marks (Nashville/SiriusXM vet), Spotify’s Global Head of Programming for Country Music, Hot Country got the next “enhanced” makeover. This meant weekly new video content (e.g., exclusive live performances, artist interviews, etc. ), and it’s given country fans another reason to plunk down more monthly subscription revenue- at least that’s what Spotify is hoping for. Spotify’s playlist enhancement move- which undoubtedly involves a significant amount of personnel and work-hours to accomplish- is in the midst of a ever-diversifying country listener. Hispanic listeners doubled in the same time period to a total of 25%, and African Americans tripled to 33%. All in all, over 42% of the entire US population was found to engage with country music, totaling to 107M American fans over the age of 12. Though the definition of listening was somewhat unclear in these findings, even at their most generous, they fly in the face of traditional expectations of an older and mostly Caucasian audience. This reflects on the artist side as well, visible in this week’s Hot Country roster: part-black/Cherokee/white artist Kane Brown makes two appearances (slots #18 and 44) in Hot Country this week, and African-Americans Darius Rucker (please don’t call him “Hootie”) sits happily in the #13 slot along with Delaware-born Jimmie Allen in the #25 position. Thomas Rhett’s “Leave Right Now”, sitting in Hot Country at the #6 spot this week…wait for the country drop at 0:53! Sonically, country continues to break out of its acoustic origins. Thomas Rhett (recently featured in Hot Country with his adopted Ugandan daughter and a pair of his latest custom-made Nikes) occupies the #6 slot with “Leave Right Now”, which features a full-blown Chainsmokers-like EDM drop in its first chorus. His label, Big Machine, commissioned a remix EP from Denmark’s Martin Jensen, along with an acoustic “Nashville” mix for the more traditionally-minded. Big Loud’s R&B-tinged Chris Lane teams up with YouTube-born, Scooter Braun-managed Tori Kelly on this week’s #24 spot with “Take Back Home Girl”- a sultry and still very country duet; LANCO sits in slot #33 with “Born to Love You”, complete with echoey-hipster “woo” choruses and synthesizer-tinged accents; and DIY artist Filmore- complete with coiffed-manbun- turns up the the #39 slot with trap-influenced hi-hat triplets and EDM-verse finger snaps in “Love That About You”. It should be noted that these artists are career players (rather than novelties), most of whom have released previous songs on Hot Country. While the playlist otherwise does skew more Caucasian, male, and with traditional acoustic sounds, these newer artists suggest an increasingly diverse country music culture on several levels. With new faces, fans, and sounds, one would think it would suit Hot Country well in today’s genre-jumping streaming world…but in digging deeper into Spotify numbers and expanding out to the rest of the the Spotify playlists, Hot Country is currently keeping up with its peers, though it’s not the strongest player…yet. 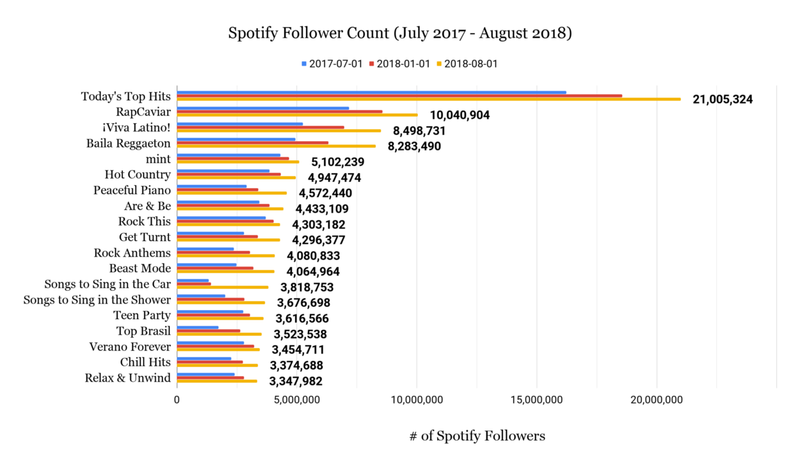 Most of the top Spotify-curated playlists show steady follower increases in the past year, and taking three follower count snapshots since July 2017, Hot Country shows a slower growth trend. While a 28% one-year follower increase is objectively good, it certainly seems tiny compared to the context-based Songs to Sing in the Car’s 187% one-year gain or location-based Top Brasil’s 103% one-year gain in the past year. 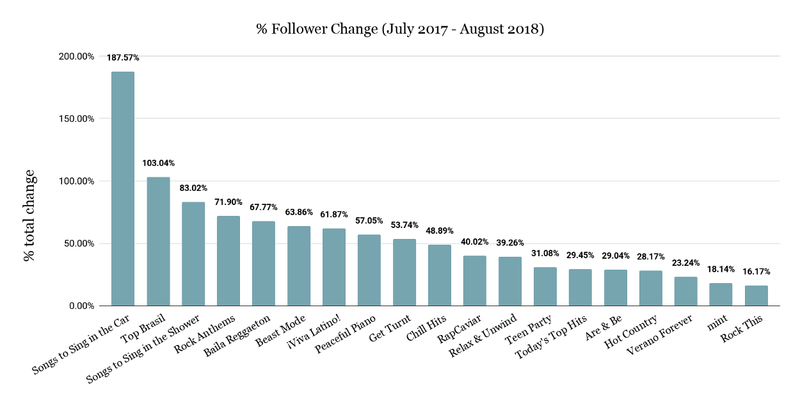 Spotify % Follower Change since July 2017…people really like singing in cars. What may be unexpected is where most of the listeners are by geography. By looking at Hot Country’s list of artists this week, we’re able to aggregate the monthly listeners (MLs) of each of their Top 5 cities that listen to them, or in other words, each of the artist’s most active Spotify cities in the last 28 days. It should be noted that these numbers are not comprehensive for each city, as an artist’s 6th or more active city are not included in these numbers, due to collection limitations. But they should give an estimate of where the artist- and genre- is most resonating in Spotify’s ecosystem. It surprised us to see Chicago (8.8M non-unique MLs) such a strong player in the country space, but I guess we’re exposing ourselves as country newbies…Atlanta (6.7M), Dallas (6.5M), and Houston (3.3M) were more expected, and Los Angeles made a very strong showing (5.4M) as well, with int’l nods to London (510K) and Toronto (30K). When combining with other genre-focused Spotify playlists and their own top cities this week, we could now see what Hot Country cities also listened to. Reflecting streamers’ increasingly genre-less behavior, the presence of a number in the same row in the above table reflects what else these Spotify cities are also playing. While we cannot say that they are the same exact users, they can be of interest from a geographic perspective. While hip hop had the most crossover, it was less strong in Toronto, London and NYC. 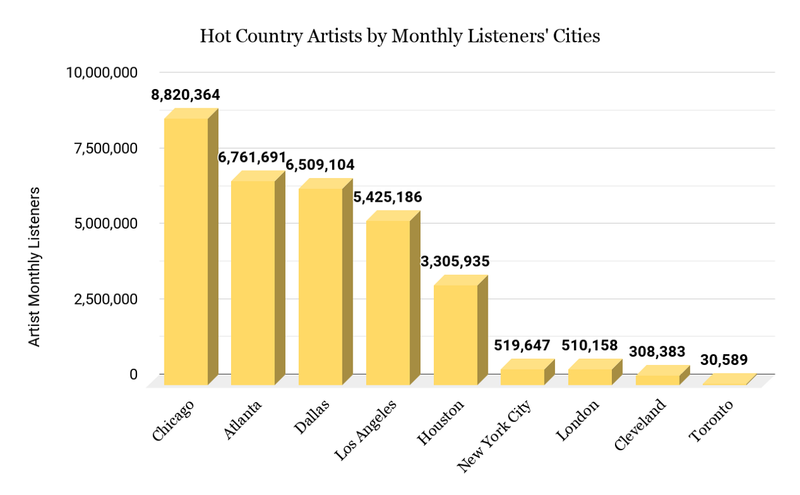 Hot Country cities also seemed to like electronic music (mint) a little less with Atlanta/Houston/Cleveland disappearing, and then only the big cities (Chicago/LA/London) had big enough of a population to also show love for Viva Latino. While Hot Country (9 cities) and RapCaviar (12) were limited in their respective lists of strong streaming cities, it was fascinating to see the border-less nature of mint (29) and Viva Latino (19) here as well. So what this mean? Hopefully, that there will be a country/hip-hop festival coming to major US cities very soon! While country is relatively young on the global stage, and yet to truly aim for an international audience as purposefully as other genres like K-pop, some of country’s artists have long been active in foreign Anglo territories. 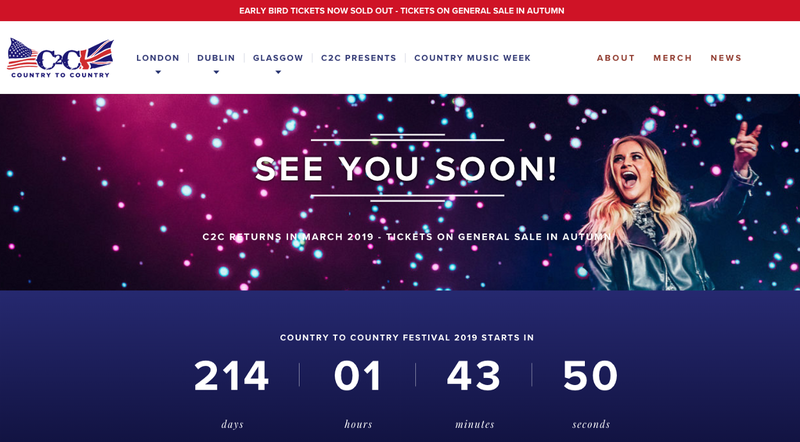 We already saw the UK and Canada in our data confirming what has been known for years by veterans like Brad Paisley, Taylor Swift, and Garth Brooks, as well as live event productions such as the AEG Europe/SJM Concerts/CMA’s Country to Country (London, Dublin, Glasgow) festival series. Down South, Australian Keith Urban leads the way for Oceanian country artists (with 210K monthly listeners in Chicago, of course), along with newcomers like loop-pedal-stomping, Newcastle-bred Morgan Evans. Just as hip-hop had ability to connect the urban-minded around the world, streaming has now unleashed country to do the same for the rural-oriented. As long as Spotify & Hot Country artist continue to promote the genre, there’s really no limit to where it can go. I mean…Spotify is active in Southeast Asian, Muslim-majority Indonesia…why not?